This is a bit special, over 100 years old this Baltic trader has no doubt some stories to tell. Currently family owned and run she has in recent times been used as a charter boat offering an insight into the golden age of sailing. Very spacious throughout, there are numerous cabins, sleeping a total of 15 including 3 crew, a well thought out galley and huge saloon area. Coupled with a huge amount of deck space this is a serious boat for serious passages. She had Cat 2 MCA Coding which enabled her to go 60 miles from a safe haven with 12 passengers up until Noverber 2014. (This has now lapsed due to the pending sale of the boat but could quite easily be reinstated). Over the past few years Ruth has toured the country to various historic marine festivals demonstrating that this boat has serious earning potential in the right hands. 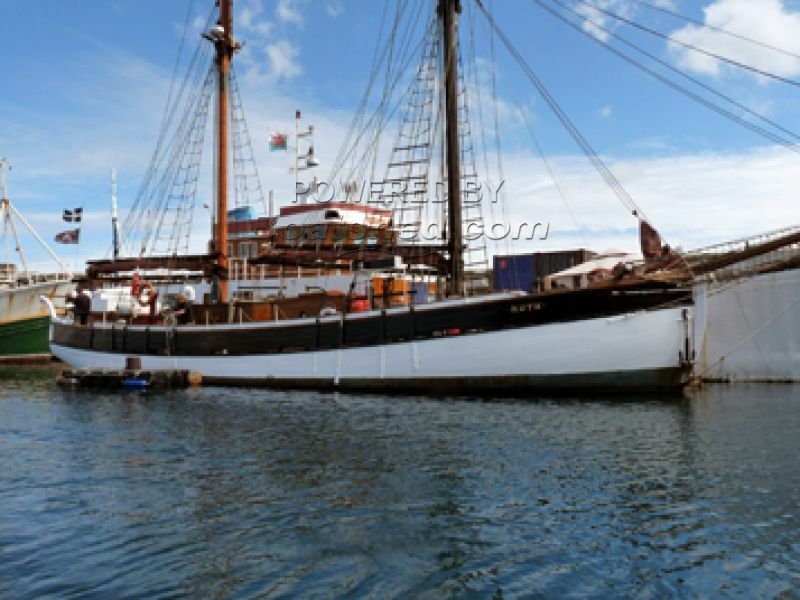 This Baltic Trader Gaff Ketch has been personally photographed and viewed by Chris Fuller of Boatshed Falmouth. Click here for contact details. Would be an amazing ship for charity use. Keeping an eye on her, a bit to soon for us. I am sure I live in the same area as her owners.